There are numerous Rights of Way within the Parish. Details of these can be seen on the Walking, Cycling & Running page of this website. The Northamptonshire Rights of Way map can be loaded here. The map is fully interactive and shows Footpaths, Bridleways and Byways - by clicking on the "+" button you can see greater detail including the identification number of each right of way. If you have any issues to report on any of the rights of way please contact the Footpath Warden, Sandy Tocher on 01788 891968. Bernard Scott acts as the Parish Tree Warden and reports to the Parish Council on any tree related matters within the Parish. Please contact him to report any dying trees or overhanging branches etc on 01788 890635. 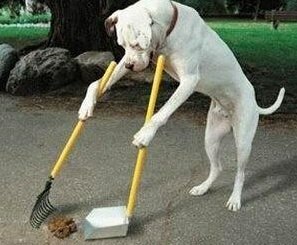 Please make sure that you take a bag with you when you take your dog for a walk and clear up any mess the dog leaves. Dog faeces can cause toxocariasis which still causes partial blindness in about 100 young children in the UK per year, and can also trigger problems such as asthma. Please make sure that our village stays clean of any mess. Full details of information on a wide range of issues dealt with by Daventry District Council's dog warden services and also the responsibilities of dog owners can be found here. If you notice that a street light has stopped working, please contact either Catherine Camp (01788 891184) if it is located in Barby, or Dawn Cotton (01788 815906) if it is in Onley. It would be helpful when reporting the problem if you could include the location of the light, and if possible the number on the column so that it can be easily identified. These are the responsibility of Northamptonshire County Council. You can ring up Northants Street Doctor on 0300 126 1000 to report a pothole. If the pothole is over 5cm deep and in the wheel line for vehicles it should be filled pretty quickly. Please don’t assume that someone else will have reported it - it is better to have it reported twice than not at all. Alternatively report it using this link to the street doctor website. You will get a reference number so you can track what action is being taken. Dom Fisher has been appointed Highways Warden for Barby and Onley by Northamptonshire Highways. A Highway Warden is a volunteer that is supported by their Parish/Town Council or Local Community Group and Northamptonshire Highways. A Highway Warden is the eyes and ears on the road network within their local area and a key point of contact between their local community and Northamptonshire Highways. A Highway Warden is a vital link to build collaborative relationships. Dom's contact details are barbynhw@btinternet.com or call 07855 821432. A number of residents have contacted the Parish Council in regard to vehicles being parked thoughtlessly in the village. Please park your vehicles on your private driveway, and not on the road. We would really appreciate it if you could take note of this particularly as the winter weather approaches and verges get wet and muddy. Please also do not park too near a road junction. This is causing particular problems at Star Corner, and on Kilsby Road and Brackendale Drive. Please park considerately and not in a way that obstructs traffic or damages neighbouring verges. Can you please assist the Mowing Contractors by not parking on the village verges as they cannot mow them if a car is in the way.